Successfully Added Digital Wireless Video Door Phone - 2 x 7 Inch Monitors, 2.4GHz Wireless, 2 to 5 Meters Night Vision, 300M Range, Tamper Alarm to your Shopping Cart. 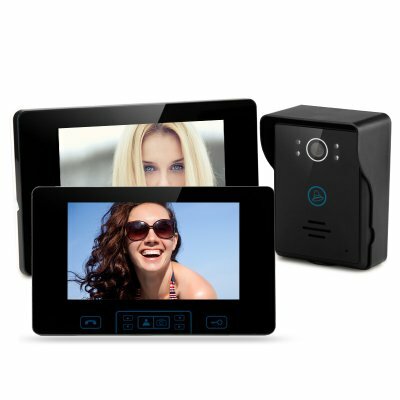 Remote Video Door Phone with two 7 inch monitors, night vision and a 300 meter reach permits you to see who's at the entryway wherever you may be around the house. Hassled by traveling salesmen or intruded time and time again by a steady ringing at your door bell? Those days are behind you as the wireless door monitor allows you to speak directly with guests without leaving off what you're doing. The big touch buttons make the handheld remote screen simple to utilize and you can also take photographs of any suspicious visitors. With functions allowing you to open electronic doors at the press of a button you can allow access to friends and family without even having to get up which can be a great help to the elderly or physically impaired who may find it strenuous to rush to the door. The outdoor camera is protected by a rain cover and features a reinforced tough glass screen to to protect if from abuse and ensure it has a long life. A tamper alarm and night vision provide additional security and allow the camera to capture anyone at your door regardless of the lighting conditions. This high quality remote video door phone brings security to any home or office.